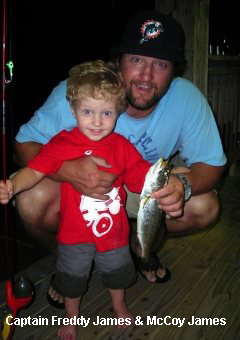 Raised on Hatteras Island, fishing has always been part of my blood. Some of my first memories were fishing with my Dad either from the beach or on one of his many commercial boats. Commercial fishing was his way of life for many years and growing up in this environment "catching" rather than fishing was the norm. Wanting to broaden my fishing knowledge and experience, I was lucky enough to be able to work for Captain Buddy Hooper on the Hatteras Fever II for a couple seasons. Whatever I didn't learn from my Dad, Buddy quickly filled in the gaps. After working for Buddy, I started running one of my Dads commercial boats a 31' Bertram call the "Diamond Girl". Mostly I would commercial king mackerel, yellowfin and bluefin tuna fish this boat in the fall and winter months. I would sneak her out in the deep from time to time to go Marlin fishing as she had the hum like most 31' Bertram's do. I was lucky enough to catch the only grand slam out of Hatteras inlet in the year 2000 on her. I continued to fish her until my Dads untimely passing in 2004. Between not having him around and the marine fisheries shutting down most of our commercial fisheries we were forced to sell the commercial boats. Shortly after I was offered a job in California that I couldn't really pass up. Spending 4 years in California, I was able to realize just how special Hatteras Island is and how lucky I have been to call this place home for so many years. In 2007 my son McCoy was born. I wanted him to be able to experience the things I did and there isnt any other place like Hatteras Island, so I moved back home in 2009. In July 2012 I was lucky enough to get a chance to purchase the Whatever. She is the perfect boat for Hatteras. Small enough to be economical to operate but big enough to be comfortable in the typical Hatteras offshore conditions. I can commercial fish her in the fall and winter months while running charters in the spring and summer. The express layout allows me to interact with my charters instead of just hollering at them from a fly bridge above. I try to give a unique, more hands on experience for your offshore trip. I enjoy taking people offshore whether its a first timer or a seasoned angler. 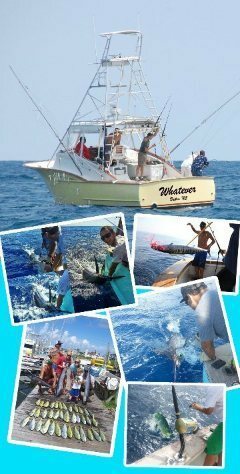 Give us a call or email to book a fishing adventure of a lifetime and your chance to experience some of the world class offshore fishing Cape Hatteras has to offer.